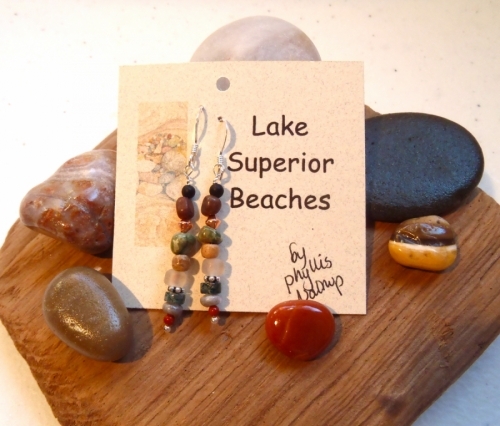 Inspired by our beautiful Lake Superior Beach stones, this is reminiscent of a walk along the lake finding stones of all shapes and colors as well as driftwood beautifully sculpted by wind and waves and the occasional piece of sea glass or piece of a shipwreck from long ago. The beads are various jaspers, agates, quartz, onyx, blackstone & other gemstones, glass, wood, with mixed metal accents. Price includes shipping.